MOSUL, Iraq (AFP) – A double bomb attack targeting buses carrying Christian students and university workers near Mosul in northern Iraq killed a shopkeeper and wounded 80 other people on Sunday, police said. The attack, comprising a car bomb and an improvised explosive device, took place on a highway around three kilometres east of Mosul, the capital of Nineveh province, at around 8:00 am (0500 GMT) an officer told AFP. The victims were travelling from Hamdaniyah, a Christian area, to the University of Mosul, he said. In November, the New York-based Human Rights Watch warned that minorities including Christians were the collateral victims of a conflict between Arabs and Kurds over control of disputed oil-rich provinces in northern Iraq. While sectarian violence has dropped dramatically across Iraq since its peak between 2005 and 2007, attacks remain common, especially in Baghdad and Mosul. BAGHDAD (AP) — Two bombs exploded minutes apart Sunday near buses carrying Christian students in the northern Iraqi city of Mosul, killing at least one bystander and injuring around 100 others, a security official said. Sunni Muslim insurgents frequently have targeted members of Iraq's Christian minority, especially in Mosul, which is home to a large Christian community. Some extremist Sunnis consider Christians to be nonbelievers and supporters of the Shi'ite-led government they oppose. A shop owner in the area was killed in Sunday's attack, said Abdul-Rahim al-Shammari, head of the provincial council's security committee. The injured included students and other civilians, he said. The attack began with a roadside bomb that exploded around 7:30 a.m. and appeared to target buses carrying students to Mosul University. Moments later, a car bomb exploded nearby. At least 17 people with serious wounds were taken to a hospital in Irbil, in the Kurdish autonomous region, said Dr. Muhsin Shamzi, who works at the hospital. "Today was terrible, and I will not forget it for the rest of my life," said Wisam Jarji, a student who was wounded in the blast. "Following the explosion, the situation in the bus was chaotic, and I could see blood stains and hear screams all over the place." The U.S.-based National Council of Churches sent a letter last week to U.S. Secretary of State Hillary Rodham Clinton calling on her to urge Iraqi officials to do more to protect Iraq's Christian community. The organization said it was particularly worried now as Iraq struggles to seat a government after the March 7 parliamentary elections. "Our concern is now particularly acute because it is possible that tensions will increase as various political forces continue to vie for power following the recent elections," the letter said. "We fear that a growing climate of mistrust and animosity will further threaten the fragile Christian community." 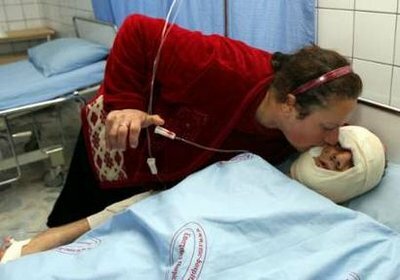 A woman looks at her wounded son, who was injured in a bomb attack in northern Iraq, after he was transferred to a hospital in Arbil, 310 km (190 miles)north of Baghdad May 2, 2010. Two bombs killed one person and injured 100 others in northern Iraq on Sunday, police said, in what appeared to be an attack on the country's Christian minority. Iraqi Prime Minister Nouri al-Maliki's bloc narrowly lost to a coalition led by secular challenger Ayad Allawi, but the prime minister has challenged the results. The ensuing political vacuum has left many observers worried that violence will rise as political battles spill over into the streets. Associated Press writer Yahya Barzanji in Sulaimaniyah, Iraq, contributed to this report. IRBIL, Iraq, May 2 (UPI) — Insurgents attacked college students in northern Iraq, killing at least two and injuring scores more, a source told KUNA Sunday. The Kuwaiti news agency reported its Iraqi police source said there were two terrorist attacks in Mosul. In one, an improvised bomb was set off in a bus carrying Christian students from the al-Hamadaniya area near the University of Mosul, the source said. The number of victims in the attacks was initially set at 80, KUNA said. FOR IMMEDIATE RELEASE: ‘FAITH, HOPE, ENDURANCE’ CAMPAIGN TO BEGIN ON JUNE 1, 2010 THROUGH JULY 31, 2010 TO RAISE AID FOR THE CHRISTIAN STUDENTS IN BEGHDEDA, IRAQ. 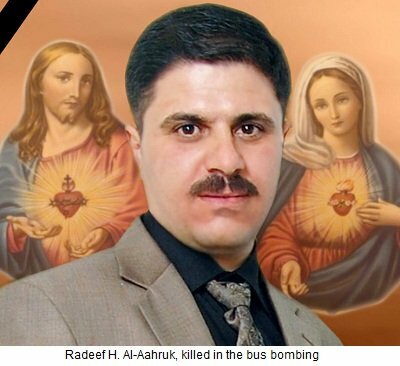 Chicago, Illinois (June 1, 2010) – The Iraqi Christian Relief Council (ICR Council) has started a worldwide campaign called ‘Faith, Hope, Endurance’ to raise $15,000 for medical needs of 60 students in Baghdeda, Iraq. 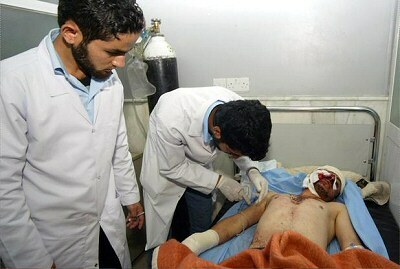 Radeef H. Al-Aahruk and Sandy Shabib were killed. 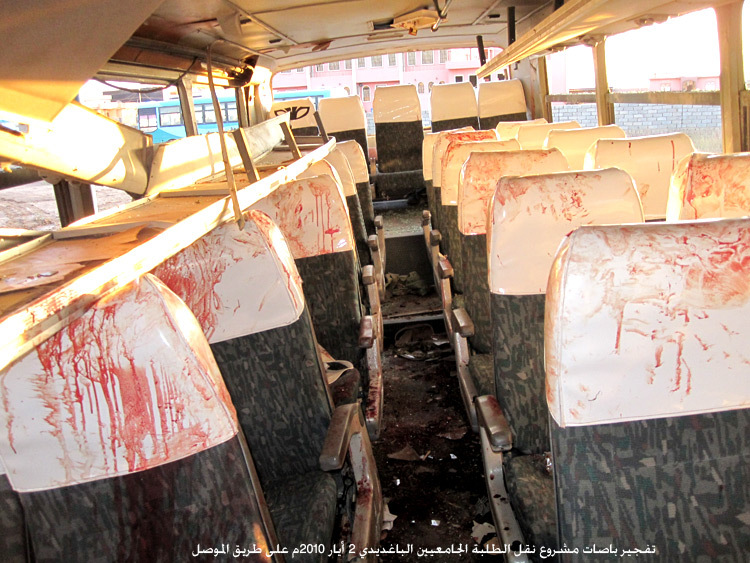 On May 2, 2010, over 200 Christian students were targets of two massive explosions. Militants attacked four buses carrying Mosul University students traveling from Hamdaniya in the Province of Dohok, Northern Iraq. Sandy Shabib and Radeef Al Aahruk were killed as a result of the blasts. 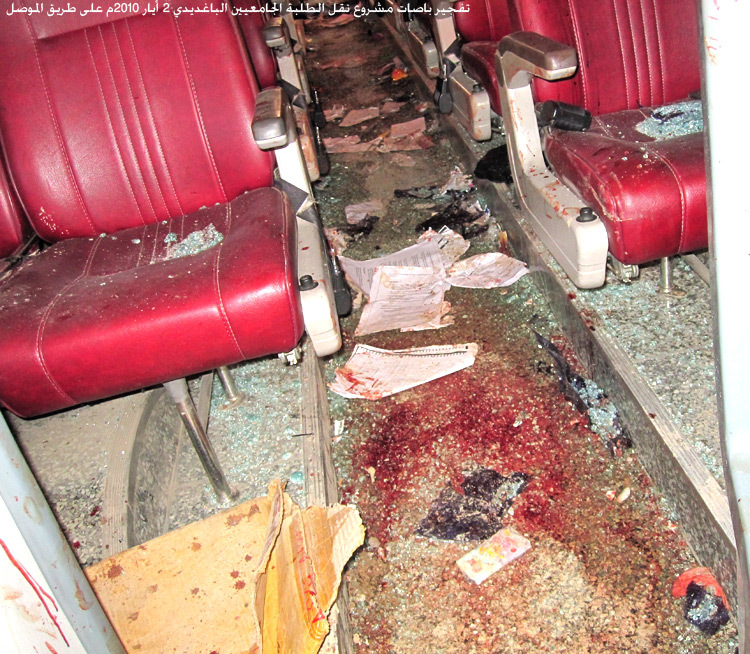 Shattered glass left over 150 students drenched in blood and scarred. Many of them lost their eyes and limbs in this attack. Currently, there are close to 60 families who are unable to provide medication for their child who has been affected by this horrendous attack. The cost of medication is approximately $150 per month per student. The Iraqi Christian Relief Council has decided to initiate the ‘Faith, Hope, Endurance’ campaign to help lift the burden off of the families’ shoulders. The donations will be forwarded to the Assyrian Aid Society of Iraq, a Non-Governmental Organization (NGO), established in 1991. When asked what the greatest needs are, we were told there is an immediate need for plastic surgeons who would like to dedicate their time and perform plastic surgery on the students who have sustained horrific injuries to their face and upper body. When asked about their morale, our sources disclosed that the students are heart-broken and are not sure how to start picking up the pieces to rebuild their futures. To help with the Iraqi Christian Relief Council efforts and to donate, please visit our website at www.iraqichristianrelief.org. 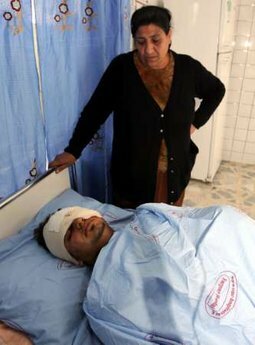 ICR Council, a 501(c)(3) organization, in coordination with entities and organizations in the United States of America, is responsible for educating the Americans of the religious and ethnic cleansing being inflicted on Christians in Iraq. Our objective in raising awareness among the Americans is asking for their prayers, raising, and delivering financial assistance for the Iraqi Christians affected by these atrocities. For additional information on our humanitarian efforts or for an interview, please contact ICR Council at info < a t> iraqichristianrelief.org. 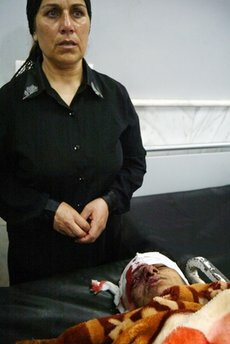 Two Assyrians killed in Iraq Bus Bombing, May 2, 2010.